FAIRFAX, Va. — The Professional Pest Management Alliance (PPMA), which serves as the consumer education and marketing arm of the National Pest Management Association, announced last month that Tommy Fortson of Terminix Service, Columbia, S.C., will retire from his position of chairman on the PPMA Board of Directors at the conclusion of PestWorld 2017 being held in Baltimore, Md., Oct. 24-28. Bobby Jenkins of ABC Home & Commercial Services in Austin, Texas, will assume the role of chairman. Mike Rottler of Rottler Pest & Lawn Solutions in St. Louis, Mo., will assume the role of secretary/treasurer, currently held by Jenkins, in addition to his role as vice chairman. Fortson has served on the PPMA board of directors since it was established in 1997, as chairman for 15 of those 20 years, and will remain a welcomed member as chairman emeritus. Lex Knox, chairman and CEO of Terminix Service, Columbia, S.C., will fill the company’s voting seat on the board. The PPMA board of directors is comprised of representatives from pest management companies and the supplier community, committed to supporting the group’s mission. They are tasked with growing, protecting, promoting and defending the industry, as well as marketing the industry to residential and commercial audiences through a variety of programs and tactics aimed at increasing consumer awareness about the value of professional pest control services. ATLANTA and MARIETTA, Ga. — Rollins announced in July it has entered into a definitive purchase agreement with Northwest Exterminating to acquire its pest control business. This will be a cash purchase, and at press time the transaction was expected to close in early August, subject to the satisfaction of customary conditions and regulatory approval. This is Rollins’ largest acquisition since it acquired HomeTeam Pest Defense in 2008. Based in Marietta, Ga., Northwest provides pest control, termite and wildlife services for approximately 120,000 customers in Georgia, South Carolina, Tennessee, Alabama and North Carolina. The company has developed relationships with premier home builders to provide pre-treatment services. The family-owned and operated organization was established in 1951 by L.A. Phillips and his wife Emma Lene Phillips. From a family of two, the company has grown to a family of more than 500 team members and 23 service centers throughout the Southeast. With reported 2016 revenue of just over $50 million, Northwest Exterminating ranked 17th on PCT’s most recent Top 100 list. Rollins will partner with the Phillips family, who will remain with the company, along with their entire management team. Northwest will continue to operate as a separate business, and one of Rollins’ specialty brands, along with HomeTeam, Western Pest Services and Waltham. TWINSBURG, Ohio — Pi Chi Omega, the international pest control fraternity, is a 67-year-old organization familiar to most people in the pest control industry. Many people know that Pi Chi Omega was founded by an entomologist at Purdue University who wanted to further the science of entomology within the pest control industry. What is less known among industry professionals is Pi Chi Omega’s mission and purpose. This desire to give people a clearer idea of why Pi Chi Omega is still relevant today is what spurred Pi Chi Omega President Judy Black to gather members for a strategic planning meeting in June at J.T. Eaton headquarters in Twinsburg, Ohio. J.T. Eaton recently hosted Pi Chi Omega board members for a strategic planning meeting. “An analysis of our purpose and the wishes of our membership is overdue, and these discussions will provide the foundation for the future of Pi Chi Omega,” said Black. The hope for the strategic planning session was to hash out an updated mission and vision statement, and to define strategic activities that will ensure that Pi Chi Omega is a meaningful organization today and for years to come. Rich Ennis, former CEO of The Steritech Group, volunteered his time to assist a group of 16 Pi Chi Omega members and board members through a strategic planning exercise. Pi Chi Omega also surveyed its membership to gain some level of understanding of its current members’ satisfaction with the organization. The survey results were shared with the strategic planning participants during a pre-planning webinar the week prior to the actual event. The groundwork for how the meeting would flow, a consensus on how decisions would be made and expectations for what would be accomplished were also outlined ahead of time. Ennis kept the group on task and focused on the big picture objectives — taking a look at the organization from a remote view of “30,000 feet,” rather than delving into a detailed analysis of the organization. J.T. Eaton arranged for accommodations and also coordinated moving people between airports, the hotel and the meeting site. Their offices perfectly suited the large group and even allowed for small group breakouts in separate spaces. In just a short day and a half, the group was able to draft a mission statement, vision statement and define some key strategic activities (these elements are still under final review). WASHINGTON, D.C. — On June 29, EPA’s Registration Division registered Bell Laboratories’ dry ice product — Rat Ice — for control of burrowing rats. The registration provides localities and PMPs with another tool for use in efforts to control these pests. Dry ice complements other registered lethal baiting and contraceptive control pesticides and offers unique characteristics that applicators may find useful. The registration is also likely to resolve enforcement issues related to the use of unregistered dry ice in some locations across the country as part of rat abatement programs. Bell Laboratories is currently working on state registrations for Rat Ice™ and will provide a more comprehensive update, including launch details, in the near future. A beekeeper prepares to install a beehive at the home of the Besheers. KANSAS CITY, Mo. — In recent years, many PCOs have been re-affirming in a variety of ways their commitment to be protectors of pollinator health. Jay Besheer, president of Kansas City, Mo.-based Gunter Pest Management, and his wife, Pam, decided to have a beekeeper install a beehive in the front yard of the home they’ve lived in for 29 years. The goal is to promote and encourage their community to take part in the protection and re-population of honeybees. The Besheers asked permission from their neighbors to make sure there were no concerns about bees flying around their homes. LIBERTY, Mo. — Douglas Products has acquired the Master Fume specialty fumigant labels from Drexel Chemical Company. Based on sulfuryl fluoride as the active ingredient, Master Fume is labeled to manage pests in structural and post-harvest markets. PROVIDENCE, R.I. — What began as a disappointing situation involving a huge blue termite, graffiti and a vandal on the run turned into an example of a community coming together to support a local business. 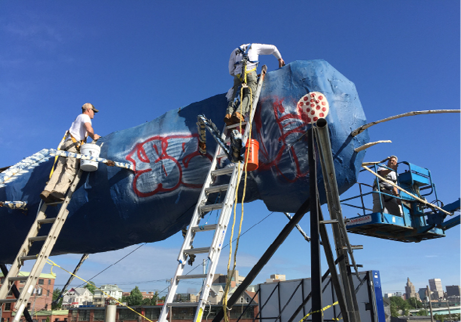 The iconic Big Blue Bug, the termite mascot of Big Blue Bug Solutions, was recently vandalized with graffiti. A man identified as a suspect in the crime, Nathan Beaumier, turned himself in to the police, WRPI.com reported. The bug, named Nibbles Woodway, overlooks the I-95 highway. The vandalism was found on the morning of June 5, when mechanic Mike Mitchell arrived at work. However, the employees at Big Blue Bug were able to find a silver lining in the situation. Goldman said the phones were “ringing off the hook” with support from the community, which raised morale throughout the company. The case received some media attention, partially because the mascot is well-known and can be seen in the film “Dumb and Dumber.” Since the graffiti was found, Goldman said the authorities have done a “fantastic job,” and dozens of local businesses offered to pitch in and help remove the paint. Sherwin-Williams donated the paint that was used, and Dennis Moffitt Painting provided the actual service of covering it up.